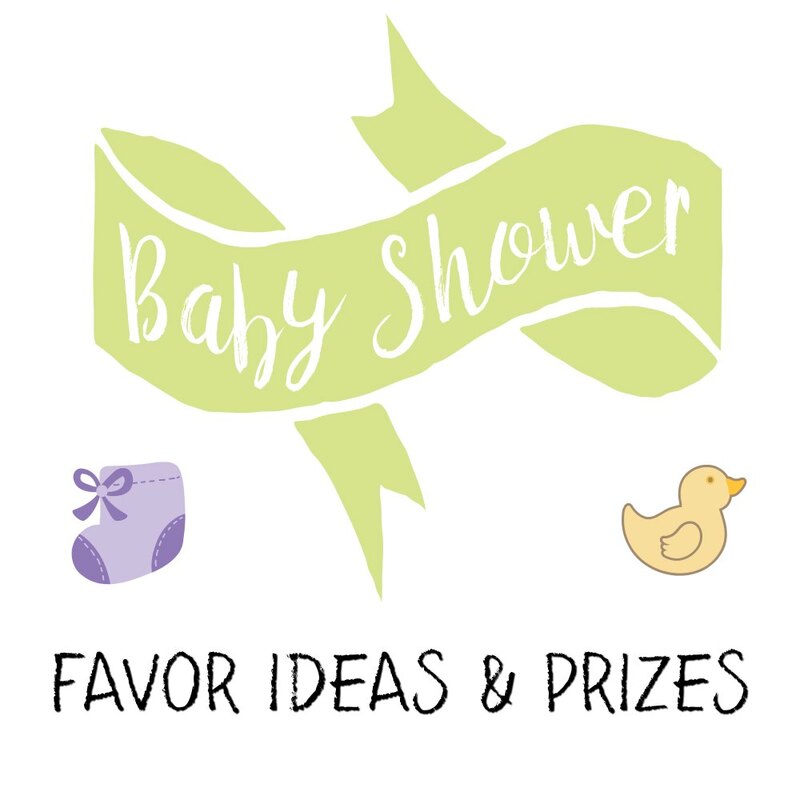 Here’s our fun selection of baby shower favor ideas and prizes. It’s always a nice touch to give your guests favors at the end of the party and prizes after playing games; it acknowledges the guest’s presence and can give them a warm and happy feeling. Once you know the amount of guests that will be arriving to the baby shower, it’s a good idea to figure out how much you want and can spend on each favor and/or prize so that you don’t soar over your budget. It will help you out to buy favors and prizes at the dollar store or wholesale. It’s also a good idea to consider your baby shower theme when choosing the favors and prizes you make or buy. Knowing what the mother-to-be and guests like can also help you out in choosing favors and prizes. In general, baby shower favor ideas and prizes can be edible, useful, or even sentimental (how about all of them together?!). You might be having all kinds of people coming to the baby shower, from the 5-year-old kid, to the childless adult, to the 70-year-old grandmother and grandfather. It can be quite a challenge to find favors and prizes that will suite everyone. You can buy or create all kinds of favors that will suite all kinds of people. 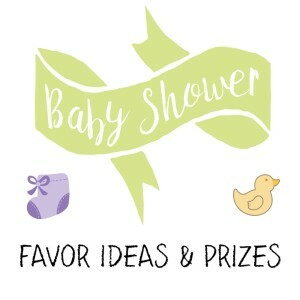 For an all-women/girls baby shower – it can be nice to give out girly favors and prizes like body lotion, bath and beauty products, little picture frames, candles, small jewelry boxes, nail polish, handmade soap bars, handbag mirrors, even gift certificates to a lingerie store like Victoria’s Secret or a coffee shop like Starbucks, etc. If you’re gonna have guy guests, think of buying or creating guyish goodies. Almost every guy is romancing his car, you can buy lots of inexpensive car-goodies like car air fresheners, special themed key holders, little car items to hang on the long mirror, etc. Also think about putting each favor or prize in something unique. For example if you’re giving out a few sweets like lollipops and homemade cellophane-wrapped cookies, how about putting them in a little baby’s bootie? You could even turn a diaper into a goodie bag… Or if you decide to put the favors and prizes in little bags, you can tie the bags with tulle or ribbon and then tie a little baby rattle to the bag. It can be really cute to incorporate little baby items into your baby shower favors and prizes. If you have a small amount of guests, you can create centerpieces for your baby shower that can later be turned into favors to give out to the guests. This is a really great idea, it saves you time, your baby shower will look great with lots of lovely centerpieces, and when the baby shower is over, you don’t need to throw your centerpieces away! After reading all of our coolest baby shower favor ideas and prizes, check out our decoration page – it has lots of ideas for lovely centerpieces. When should you give the favors out? Whenever it’s most suitable for you. It might be easier to give out favors at the end of the baby shower when guests are starting to leave. You can also decorate with your favors or place all of them on one table (with a name for each guest). It can be cute to bake little cinnamon/honey/or chocolate buns, wrap them in cellophane paper, tie with ribbon, and attach little notes saying “Thank You for coming!! – from [expected mother’s name] “Bun in the Oven”. This is one of those cute and simple baby shower favor ideas! Everyone has come to celebrate a baby’s growth (and soon birth), right? So why not plant seeds that will give birth to new flowers and plants? You can give each guest a little plant to take home and grow for themselves (you can buy lots of little baby plants or flowers for cheap at gardening nurseries). You can also create little baggies of plant and flower seeds so that the guests can take home and plant for themselves. You can personalize both the little baggies and the little plants by printing out a cute sentence or poem (for instance, “keep this plant and nourish me in honor of the soon-to-be baby”) on stickers and stick them to each baggie and/or on the little baby plant pots. A really cute idea is to buy glycerin soap in the colors of your theme. There are all kinds of beautiful glycerin soaps that are a bit see-through and have little toys, shells, shapes, fruits, candies, leaves, etc. inside of them. You can wrap each soap separately and attach a lovely note saying “You came to shower [expected mother’s name] in pink and blue… now it’s your turn to SHOWER too!”. You can also give the soap out in a little gift basket with a shower sponge. You can create your own cookies to fit your theme. You can buy cookie cutters in all kinds of shapes that suite your theme or mix-and-match (for example teddy bears, rubber duckies, storks, baby rattles, baby bottles, babies, etc.). Then frost them with suiting colors and at the end wrap them with cellophane paper (could be different colors of cellophane paper) and a bow or tulle on the top for tying. You can also tie on a little note with ‘thank-you for coming’ or with a cute baby poem for that finishing touch. Who doesn’t love the excitement of Lottery tickets? You can buy lottery tickets, wrap them in baby wrapping or with a beautiful colored-paper, and write on the paper or a separate attached note “We are so lucky you joined us! Are you feeling lucky too?”. You can personalize candy and chocolate bars to fit your baby shower theme. You can personalize and buy these online or even better, make your own! To make your own, first purchase the candy/chocolate bar you want to use (best if they are flat like a hershey’s bar so that you have room to write on top). Take one bar and take off the wrapper. Look at the size of the wrapper and in a design program in your computer (like photoshop, fireworks, illustrator, or even basic ones like word or paint) create the size of the wrapper and fill in with text and color. Then print out and tape or glue wrappers around each candy/chocolate bar. Cute magnets are always useful for decorating that white refrigerator! You can buy magnets at craft stores, cut them into any specific shape (a shape that may suite your theme), print out on a piece of paper a cute little baby poem or something to remember the baby shower with, cut the paper in the shape of the magnet, and glue on the magnet with strong glue (I recommend you laminate the paper before gluing to the magnet, that way the magnet stays durable for a longer time). If you like the classic fortune cookie, how about buying lots of fortune cookies, dipping one side of each in white or dark chocolate and sprinkle a few sprinkles (that match your theme colors). You can try buying lots of little Chinese boxes (or who knows, if you’re in good terms with a local chinese restaurant, they might give you a lot for free or for a minimal cost). Then take each chinese box, wrap in baby-style wrapping (or wrapping that suites your theme and/or theme colors), put some colorful tissue paper and a few favors including the lovely fortune cookie. You can add a little note in the box saying “We’re so ‘fortunate’ in having you at our baby shower, what is your fortune for today?”. You can print out baby shower bookmarks. Write something special on the front, add some clipart or graphics that suite your theme, print out on colorful paper, cut out and laminate (so that it stays durable). Beanie babies are always a popular choice, everyone loves them! If you don’t know what beanie babies are – they’re little stuffed animals with or without a key chain. The key chain beanie babies are smaller and more inexpensive than the ones without the key chains (which are usually bigger in size). They are also soooo cute when putting on a key chain with all the keys, I’m sure everyone will love them! You can choose beanie babies that suite your theme, or just buy all kinds and put them in a basket so that guests can choose what they like most. my question is can i just give a animal candle as a gift favor, it comes in a clear box small cut cute? how many favors do you give ? is 2 to much?